2017 Update: We still stand by these Skype interview tips — but you may also want to check out our latest post with video interview tips for your online job interview! Help! I am a 1L interviewing for summer associate position and the firm has decided to do a Skype interview. I am terrified I will look washed out/ too made up/ etc on camera. Any tips for hair/makeup? Also, my career service office recommended wearing a nice blouse, but I feel a suit would be more appropriate. 1) Download the program NOW, if you haven’t before. Start playing around with it. You may even want to see if there’s a way to record yourself talking on Skype (or talking on the other end of Skype) so you can practice — really practice — where to look and how to do it. Make sure your sound is good, make sure your Internet connection is good. My guess is that your computer should be nearly eye level in order to do this. 2) I’d wear a full suit for your Skype job interview. It will get you in the “interviewing” mindset, and will help you feel more professional during the interview. In this About.com article on video interviewing, the Tech Expert for Skype recommends avoiding patterns unless you’re sure how they’ll look (dots look worse than stripes) and staying away from bright colors (sky blue looks great, but red/hot pink don’t look so hot). You could just do the top half of the suit (cue memories of some comedic anchor joking about only wearing boxers during the newscast) but this could work against you — you might have to walk across the room to get something. Play it safe; it’s an interview. 4) Finally, focus on your posture. Because you’re in your own house you may feel more at home — don’t; this is still an interview. You might also want to be wary of awkward pauses in the interview, when you might be tempted to fidget, look bored, or allow yourself to be distracted (as you might during a pause in a telephone conversation). You’re still on camera; act as if you’re sitting in that person’s office. Social media picture via Stencil. I haven’t interviewed on Skype, in particular, but I -have- interviewed via video-conferencing. If you can sit a bit back from the camera/screen, do it. You won’t look quite so bizarrely proportioned on the screen, and if your eyes flicker between the screen and the camera it won’t be as noticeable. If you have a tendency to gesture with your hands in front of your face, SIT on them. In a video interview it’s vitally important that your hands not be up in front of your face the entire time. When considering where you’re going to do the interview, also consider the lighting. You might be better off trying to get a good effect with the lighting instead of by getting expensive makeup. And for the love of god, wear a suit! Interview = suit; interview = suit; interview = suit. Period. Full stop. Also, think about the background – a plain wall likely would be best. Hm. Never used Skype, but in a previous life I was a published author and got interviewed on radio and tv. What I needed to learn, and did eventually, was A – prepare your look and your material beforehand so that B, and this is the important part – when you are in front of the camera or microphone you are paying attention to NOTHING other than the interviewer. Camera doesn’t exist, mike (mic) doesn’t exist. Also: when done talking, shut up :) Meaning, of course, don’t babble. Listen closely to the question, answer it, then stop talking. With radio/tv interviewers, it is not your, the guest’s, job to fill dead air. Same with a job interview. Don’t annoy the interviewer/waste their time by yakking on off-topic. Everyone knows this already, obviously, but cameras make people nervous, and it can get away from you. Good luck! You’re clearly the type to prepare beforehand, so you’ll do great. -As tempting as it is to make them full screen when you do the call, I find the best experience for the OTHER USER comes when I keep the video chat window the default size and drag that up to the top of the screen so that it sits right under the webcam. That way, even when I forget to look at the webcam directly, I am still looking very close to it and it doesn’t look I’m looking down or reading. Also that way I can talk to them by looking at my camera’s green light but still kinda get a little peek of their reaction. This is harder if their face is further away on the screen. Set it up first and then don’t move the computer or retilt the screen during the call, unless they ask you to adjust the picture. It’s just distracting. -I get the most compliments on the video looking good on my end when I am in natural light but no matter what you want plenty of light. It looks grainer when it’s dark. You want the light to fall on you, not on the computer necessarily, so I try to put the light/window right behind my screen. That way the other person isn’t staring into my bright lamp. -Make sure that you turn off other programs on your computer because you don’t want to be embarrassed by unexpected sounds, just like with the phone. And you don’t want to be tempted to multitask on your computer because they can definitely tell when you’re not paying attention. It’s probably good to just have skype and if you want a small window with a couple notes open right next to the chat window by the camera and that’s it. You can mute the sound on your computer once you answer their call and then you won’t be interrupted by strange noises. -There are a bunch of utilities for recording yourself if you want to see what you look like, but I don’t think Skype will do it. 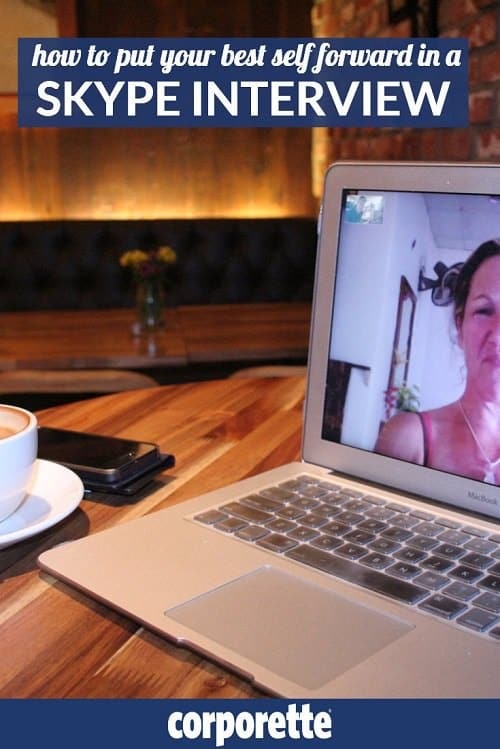 —–I’m a Mac but if you’re a PC it looks like you can use the free demo at  Pamela for Skype (http://www.pamela.biz/en/) to record a demo practice call with a friend. It’s free for a 30 day trial. —–There is also a program for Mac that has a free demo, called Call Recorder from Ecamm (http://www.ecamm.com/mac/callrecorder/). Also, Macs that run Snow Leopard will let you record videos on your webcam using Quicktime, which is on every Mac. Just use File > New Movie Recording. Older Macs may need Quicktime Broadcaster for that. I haven’t tried it but you maybe able to use the Quicktime’s File > New Screen Recording while also doing a practice interview with a friend in Skype. These save to your Movies folder. -Lastly, whenever doing anything important with your computer, like taking exams, I always update my software first. That means your Windows or your Mac (Software Update in the Apple Menu) operating system so that it doesn’t offer to do this for you in the middle of your interview. I have had trouble getting PCs to actually stop downloading and updating when they really want to. Always have your computer plugged into the wall outlet when you are updating the system. I’ve interviewed people and conducted business using Skype. I’d recommend having a bookcase or other office setting behind you, if possible. Be prepared for some awkwardness or sound problems, and be able to handle it with a smile. Do wear a full suit, in case you have to stand up to get something. I recommend actually minimizing the window so you’re not looking at the interviewers – look at the webcam instead. If you need to be able to see the interviewers, move the window as close to the webcam as possible. You want to look into the webcam, not at your screen. You may want to angle your computer so the webcam is at eye level or slightly above, as from below is not the most flattering angle. Finally, be conscious that background noise will be picked up much more easily than when you’re on the phone and plan accordingly. Skype (and webcams in general), tend to accentuate the shadows on your face, so be mindful of the lighting! Get your set-up ready the day before (at about the same time of day) and try to position a diffuse light source right behind the camera so that your face is evenly lit. Make sure that light sources from your sides or behind you won’t create weird shadows or color casts. Finally, y’know the little box where you can see yourself? Either turn off or locate it at the top of the screen near the webcam. The tendency to watch yourself is really really strong unless you’re used to Skyping. Ugh, my original reply got deleted. Only thing I would add that hasn’t been said is that watch out for sound delays. I did a video conference interview my 2L year and there was about 3-4 second delay after the interviewer spoke. I would sometimes forget that and start talking, only to realize that we were talking over each other. It was awkward, but we both laughed it off and I ended up getting a call back. Also, I 100% agree with making sure you look at the interviewer, NOT yourself on the screen. It’s very hard not to, but try. Finally, don’t touch your hair or face during the interview, it’s very distracting. Good luck!! This is at least the second comment where someone said their reply got deleted — are there shenanigans afoot in the comments section? What happens? LOL. I got the same 404 error yesterday after posting a long, rambling reply. I figured it was for the best since it was so rambling anyway. Happened to me the other day a couple of times on the 25th hour thread, with the 404 error. I had a skype interview a couple weeks ago for a position in California. What do you think is the proper thank you etiquette following a skype interview? Email thank you? Thank you letter? If your interview was a couple of weeks ago, and you haven’t already sent a thank you note (via email or regular mail), I wouldn’t at this point. You really need to do that asap for it to be meaningful. Although I generally hate thank you emails, I only ever send thank you emails for interviews because your interviewer will probably have to submit feedback on you long before snail mail would reach him/her. I tend to send a thank-you email within 24 hours after my interview and follow up with a written thank you sent by mail. At my last firm, at least two interviewers raved about my thank you notes, so employers do pay attention to this stuff. Don’t bother sending the email now, but send the written thank you; it’s probably too late for it to matter in terms of decisionmaking, but it’s a good, proper thing to do and doesn’t hurt. Send a handwritten thank you. I like getting them. I’ve also noticed that the folks who send thank yous tend to get offers from my firm. I don’t think this is a causal relationships , but I’ve noticed a pattern. Handwritten thank you on professional-looking cards, but you should have sent it immediately after the interview. Be sure that there is not a window behind you. Light from a window can cause a bright glare on the screen and will also wash out the color in your face. I second Sei’s comment (above). Make sure that the camera is capturing you from the most flattering angle possible. I only got skype recently , but I did want to chime in – if you dont have a camera yet, go buy this logitech (http://www.amazon.com/Logitech-Webcam-Pro-9000-Frustration-Free/dp/B002M78ECK) – its supposed to be the best camera for skype, and having skype-called people who had a logitech on their end versus not, i can tell you it makes a world of a difference. The logitech auto adjusts for light very well. Also i set the camera on my laptop next to my builtin mouse, and can therefore angle it well with minimal drama. Preferably, if you know anyone with skype, do a test call first so they can tell you how you look lighting wise etc, and you also get a sense of how it works. Echo the point about camera angle. It is more flattering to be seen from above than below. If at all possible, position yourself below the camera or at LEAST at the same height. Also, as was said, having their video window be as close to the camera as possible will help. No backlighting is important. If you have a window behind you, this is actually perfect! Turn around and put it at your ~10-11 o’clock. If you are lit only from the screen and above, you have shadows in bad places. And the sunlight is a better color for your face. No window? incandescent, or anything bright, at that same angle will also fill in shadows and give better color. If you are Indian or black or otherwise dark-skinned, fill light is even more important. The cameras are calibrated for white faces. Not only do dark faces lose their features but white eyes and teeth popping out from them can look very weird. Really try to get as much light on you as possible. When you are talking, look at the camera. When you’re done talking, look at the screen/image. Then you are maintaining eye contact as you speak. If you need to also record your video interview over Skype, check-out VodBurner for Skype http://www.vodburner.com. It’s free. Hm, question about looking at the camera, rather than at the interviewer’s face on the screen. If I’m looking at the camera, aren’t I missing cues/info from the interviewer’s face? Or is the fact that I’ve never used Skype showing? Sorry. depending on your set up, looking at the interviewer while you speak will make you look like you’re looking down–not really the impression you want to convey. best to sit a bit back from the screen and make sure that the camera is roughly the same level as your face. I use skype quite often and my biggest advice would be to turn off the overhead light and use some other form of lighting – a big overhead light gives you funny shadows and really washes you out. Wow guys- thank you so much for all your helpful advice!! I found the hardest portion of the interview was to look at the camera because i wanted to look at the interviewer but I listened to all of your helpful hints and am keeping my fingers crossed! Be certain your background looks professional or at least not distracting. Eliminate noise makers…barking dog, ringing phones, TV or radio. Make sure your camera is eye level. Dress professionally. Keep a pleasant look on your face at all times and articulate. Speech can easily come across mumbled if you are not focused. Also, if possible plug your laptop in to the wall instead of running on battery power. Your power default settings for battery may try to economize and result in poorer quality sound or video. I had this happen recently, and when I plugged in to the wall, the quality improved. Or, if you need to use battery power, check that your power settings are for maximum quality (in the control panel for PCs). And I recommend to use Evaer skype video recorder (http://www.evaer.com) to recording skype video and audio interviews. I am using skype to do a video diary for my baby cousin Addie.